Do you like sumptuous drawings and colored renderings of gemstones and fine jewelry? Interested in basic design principles for commercial jewelry making? Want to impress customers and colleagues with your jewelry rendering skills? This book could be right for you. Purchase this book at Amazon.com now! As a serious goldsmith who does counter drawing or wants to improve their rendering (and possibly design) skills you should add this one to your collection. It is an excellent reference for professional jewelry drawing skills. A recommended pick for the professional crowd. If you want to learn to render gemstones in a traditional manner this book is it. The book is arranged as a textbook for classroom and self education. This is a great book for learning how to render jewelry, if one is willing to take the careful, dedicated practice time necessary to work with it. For a really good if rather rigorous self education one could copy the book page by page and end up being a very good jewelry renderer – it would be rather a feat of tenacity and endurance to do so however because of the number of high quality drawings in the book. 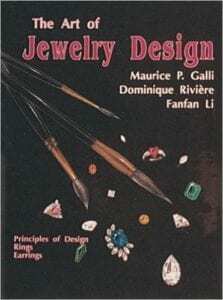 I personally use this book among others as a text for a jewelry rendering class I teach. The book is best if it is used with a proper course. The book is over 220 pages long, 12×9″, lots of full page color pictures of excellent renderings. Major sections include Basic Principles of Design and documentary Studies, Metal and Stone Rendering Techniques and Jewelry categories. Each of these large sections is made up of 20 to 30 or more subsections which are usually one page about half full of text describing and commenting on the lesson and the facing full page full of drawn and rendered examples. It is a beautiful coffee table size book with a great binding, hard cover, lovely glossy smooth paper, a good printing job. However I found the format and size such that it was daunting to read, not comfortable somehow, the book seems a bit inaccessible, that is it is a little hard for me to use it as a text book, something in the layout seems somehow difficult to look at and read. When I first saw it I had dismissed the book as a serious text because of this but upon careful re-reading and re-examination my mind changed significantly and I liked it a lot better. For best results read it slowly and carefully, following the steps given. Rendering is about speed and communication of ideas to the client, to oneself and to other goldsmiths. This book does a good job of showing how rendered surfaces and gems are built up in a minimum number of steps, with a reduced palette of colors and techniques for maximum effect relatively rapidly. Many drawings show all the stages of a built up rendered surface. That is the key to rendering. It is a reduced drawing system, of conventions and visual tricks, which anyone can learn without having to be an artist. All it takes is practice. There are other drawing systems around for jewelry rendering and this represents only one avenue among many, but it is a good approach. The book also purports to teach design, which it does in a strict, old fashioned (yet very sound) series of discussions and examples of design principles for formal design, that is designs based on geometries, documentary studies of nature, symmetry, asymmetry and so on. The book’s failings in my view have to do with the design part of it. The design aspects of the book seem antique, too exclusive in commercial context. Heavy on gemstones. Lets make that very heavy on the gemstones. Victorian, Art Nouveau and Art Deco approaches to research and method are copied scrupulously in the unvarying and unquestioning traditions and conventions of late 19th and 20th century. It is about very expensive (think Harry Winston oriented) commercial jewelry. What I am trying to say is that many of the designs pictured seem old hat, hackneyed and serve primarily as a vehicle for selling the most gems that one can. This is of course a primary goal of the industry and seen in that light the conservative designs pictured are that way because they presumably work as a method of moving a lot of product and the design system taught is centered around the gemstone shapes as the major design components. It would, however, be nice to see these highly skilled methods applied to more contemporary work. Look at German magazines for a hint of how exciting designs for commercial work using pots of expensive gemstones can get. North America needs to wake up in design terms and unfortunately this book does little to shake up the scene for new markets and new avenues for profit. Finally this book is an excellent resource and reference. I insisted upon my College library obtaining this book and also its later sequel ‘Designing Jewelry’.